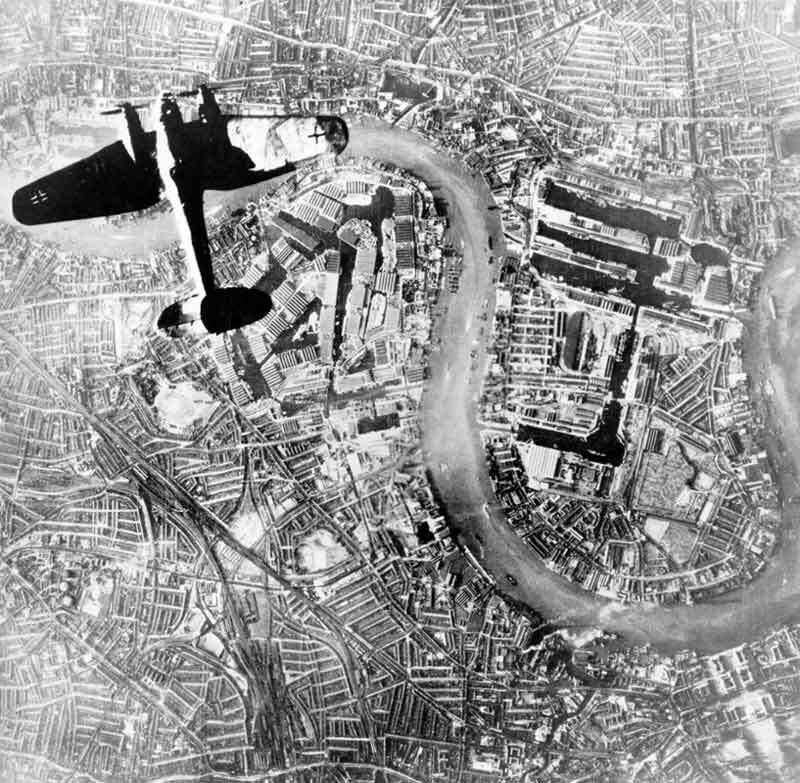 7 September 1940: at about 4:00 p.m., the Blitz of London began with the German Luftwaffe attacking the city with 348 bombers escorted by 617 fighters. After dark, a second wave of 247 bombers attacked using the fires from the earlier attack to guide them. — Duel of Eagles, Group Captain Peter Wooldridge Townsend, C.V.O., D.S.O., D.F.C. and Bar, R.A.F. Cassell Publishers Limited, London, Chapter 27 at Pages 393–394. Approximately 1,000 Londoners were killed that first night. 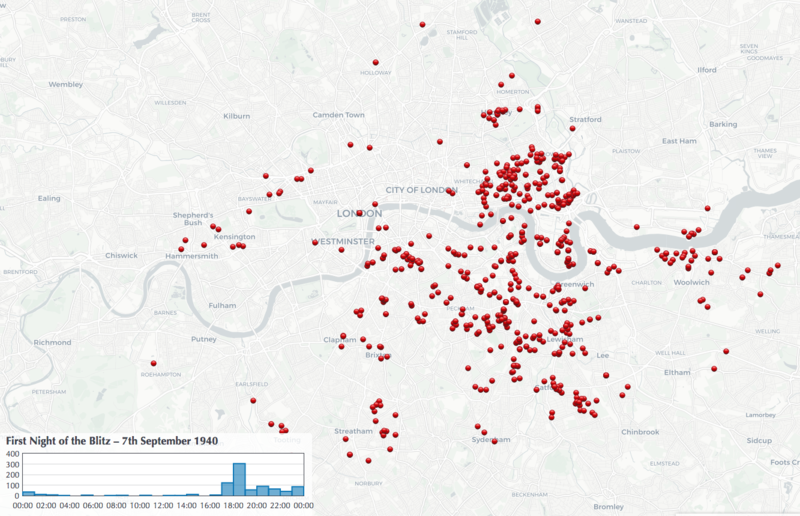 During the Blitz, London was bombed for 76 consecutive nights. German military leaders believed that England could only be defeated by invasion. Before Germany could stage a cross-channel invasion, though, it had to gain air superiority. After weeks of relentless devastating attacks against British airfields, Reichsmarschall Hermann Wilhelm Göring made a fatal mistake. He shifted to attacking population centers. 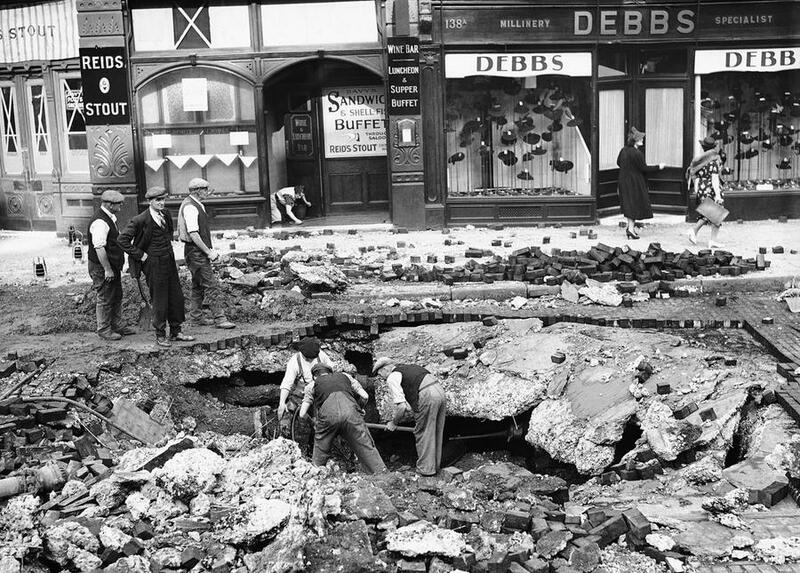 A bomb crater at the Elephant and Castle, London, 8 September 1940. 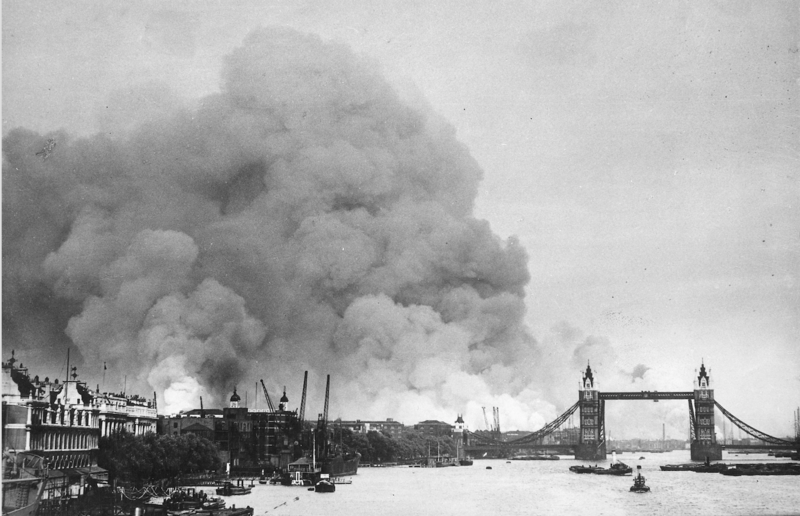 The primary purpose of the Blitz of London was to force the Royal Air Force to defend the City. Luftwaffe commanders believed that they could destroy the RAF in battle. And the RAF had to be destroyed for an invasion of England to go forward. By the end, losses in airplanes and crews to both sides were about even, but the RAF survived, thus Germany failed in its goal. There was no invasion. 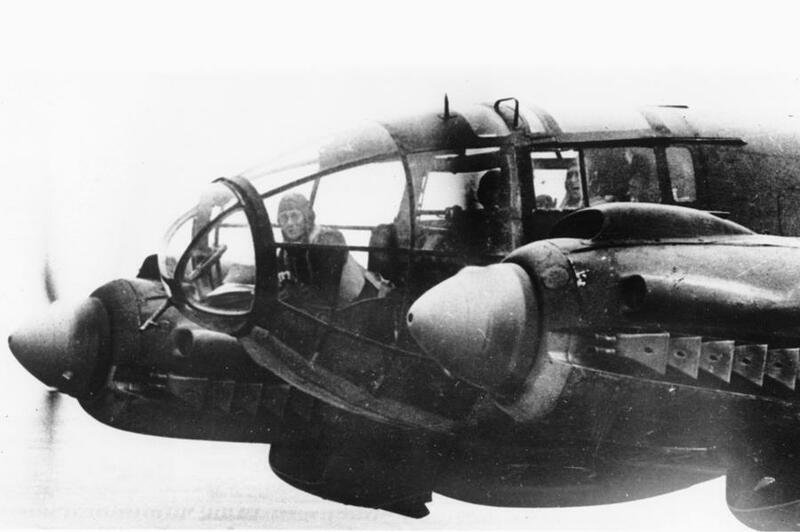 The Heinkel He 111 was the primary Luftwaffe bomber. It had a crew of 5 or 6. The airplane was powered by two liquid-cooled Junkers Jumo 211 inverted V-12 engines, producing 1,200 horsepower each, giving the He 111 a maximum speed of 254 miles per hour (409 kilometers per hour). The bomber was 59 feet (17.98 meters) long with a wingspan of 77 feet (23.4 meters). It was armed with three or more 7.92 mm machine guns, and could carry up to 4,400 pounds (2,000 kilograms) of bombs. It had a maximum range of 1,420 miles (2,285 kilometers). 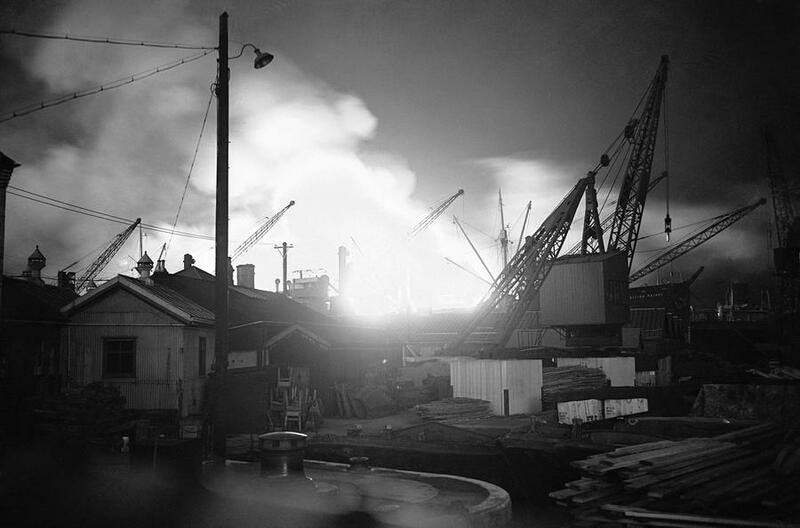 Fires burning at the Surrey commercial Docks, 7 September 1940. By clicking on individual icons, information on the location and type of bomb is provided.